Ulsan, Korea – October 16, 2013 – At K 2013, Songwon (www.songwon.com), the world’s second largest supplier of additives to the global polymer industry, is demonstrating how their continued investment is meeting the needs of their customers for the security of supply of reliable and innovative stabilizer solutions. Songwon will deliver yet another year of growth and productivity which continues to provide a solid foundation for investment, making them one of the most secure supply partners to the polymer industry. Songwon’s state of the art, proprietary processes form the back bone for delivering an ever increasing portfolio of solutions that perform with reliability and consistency, in an ever changing and growing polymer world. Despite economic uncertainty, Songwon’s consistent performance delivers the stability and reliability that customers need for their growth plans, safe in the knowledge that Songwon will continue to be alongside them in the future. Among the highlights that demonstrate that Songwon is meeting its promises, is the recent introduction of Hindered Amine Light Stabilizers (HALS) which will be supplied globally in cooperation with Sabo. In China, a joint venture with Tangshan Baifu Chemical Co. Ltd. is now capable of delivering 8.000 metric tons of SONGNOX® Thioester Antioxidants which are widely used in PE, PP, ABS, HIPS, polyester and polyamide, as well as other materials. SONGNOX® OPS (One Pack Systems) is also growing strong. 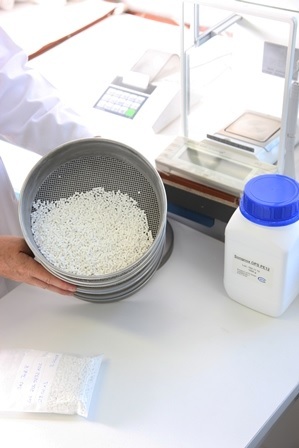 OPS combine a range of additives into a dust-free pellet form and offer greater assurance to the compounding process reducing quality control, eliminating over- and underdosing as well as enabling a cleaner and healthier working environment. Songwon has invested in production technology and has developed processes that continue to deliver increased capacity at sustainable economics. The investment in 2012 in OPS technology in Greiz, Germany has been bolstered by further investment in global manufacturing capacity to ensure consistency of products and quality in all regions. A new 7.000 metric tons plant in Houston, USA started up its operations in 2013 and will be followed by a production facility in Kizad, Abu Dhabi in 2014 running on the same technology. Songwon will continue to deliver products that meet customers’ needs without compromising its environmental stewardship. To that end, it has embarked on a proactive investment program to expand DOTO (Dioctyl Tin Oxide) which is being driven by REACH and other global environmental regulation initiatives, that will lead to the replacement of Butyltin compounds (DBTO Di-n-Butyltin Oxide) by Octyltin compounds by 2015. Songwon is available to further discuss these developments as well as its wide range of innovative polymer stabilization solutions at K 2013 on Stand C79 in Hall 6.